The Baynhams: Its all Karens fault. My floors are dirty. The dishwasher is sitting full of clean dishes while the dirty breakfast bowls balance precariously on the counter top. The washing machine needs to go on or there will be no clean socks in the morning. The bins are over-flowing and I'm still in my pj's. She lent me this book....! The place is a tip and I think I've lost one of the kids under a pile of un-washed laundry. 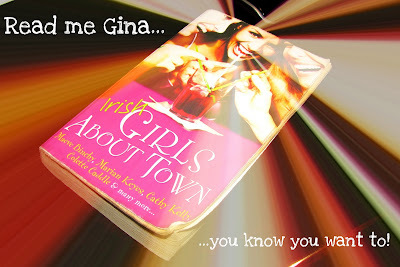 Gina - thank you so much for your kind words about my post! You are exactly right about not concentrating on the good! I work on that every day. Love your blog, I will stop by often! Ahhh, feet up....tea's on.....good book.....life is good! Enjoy! Ack, that is exactly why I don't allow myself to read during the school semester. I never get anything done. You deserve the break. Enjoy the book. Is Byron Irish, too? He certainly talks like one. I went to the library a couple of days ago for a book. They didn't have it. I put it on hold...along with three others. I also left with four more. Byron has requested that I clarify his nationality. He IS NOT Irish in any way shape or form. Despite how he seems to talk he was born, is now and forever after will be WELSH! No amount of time spent around me, no amount of pints of Guinness and no amount of U2 will make him mutate even 1% from his 100% proud to be Welshness. Believe me, I have spent 15 years trying! I am the exactly the same when I get a good book!! I have read that its a good one! !